One of these years I’m going to make it to Rhinebeck…my husband’s cousin lives, like, RIGHT THERE! Maybe next year. Have fun!! I can’t wait until your shop is up and running again. :) I hope the rest of getting your studio together goes smoothly. Beauticious! 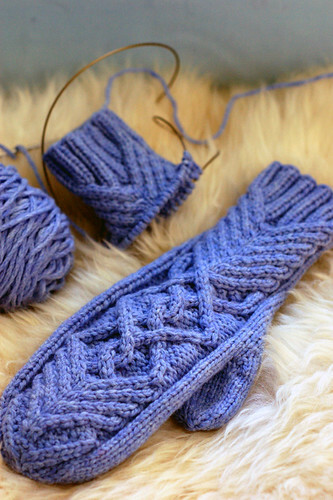 Fall is the perfect time to knit something as practical as mittens in anticipation of winter. These will come in handy in your new home by the ocean. And the two right mitten thing: I’ve got you beat. I once knit two left fronts to a cardigan! Such pretty mittens. Love the color. They look so warm and soft! Love the mittens! Thanks for the link. I absolutely love those Cork mittens! I still have a couple of skeins leftover from my “bought on closeout” batch of Cork, which just might have to become a pair of mittens now that I’ve seen yours. Gosh, I check your blog daily to find out about the Fiber club. Only thing I kept seeing was that it was available to only past members, I didn’t even think that I should check the shop to see if there was an item open to buy. Is it still only for past members? I guess I didn’t understand. Can you put me on the waiting list? How about the Fiddlehead mittens, will that be a sneak up too? Are you perhaps starting to keep a list of those who would like mitten kits? these are lovely. the cables really pop, don’t they. that is so interesting. nice with some warm mittens. i need to try it out some day, as i think mittens is THE thing i never knitted in my very long knitting career. your mittens are inspirational. especially the self designed. I get to meet you finally! Oh, please add a waiting list! I’ve never been able to make it through the scrum to sign up. They are very beautiful! Particulary the cables at the wrist. I love this yarn! The colour is to die (dye!!) for!! Hi…I’m a long time admirer of your work, and have been checking often for fiddlehead mitten kits. Do you think you’ll have some before xmas? No pressure….I’m just wondering. Thanks.